Alciato at Glasgow: Emblem: Prudens magis quàm loquax. PLUS ADVISE, QUE non pas langagier. Inter aves sani noctua consilii. Garrula quo cornix cesserat antè loco. 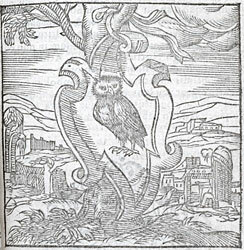 The owl provides the symbol for Athens, Cecrops’ city, for among the birds the owl is known for wise counsel. Deservedly was it dedicated to the service of weapon-bearing Minerva, in the place vacated by the chattering crow. loquacitas nullo habetur in numero. En lieu dont fut mise hors la Corneille bavarde. tifie principalement par le silence de la nuict. stoit imprimee la figure d’une Choüette. 1. Cecrops was a legendary wise early king of Athens, a city renowned as a place of learning. See above, Emblem 6 ([FALc006]), line 7. 2. garrula quo cornix cesserat, ‘vacated by the chattering crow’. The crow was dismissed from Athena’s service for telling tales, and was replaced by the owl. See Ovid, Metamorphoses, 2.562-5. This story is represented in Aneau, ‘Periculum in terra, periculum in mari’ ([FANa029]).